Shaikh Zayed Islamic Center (UOP) Peshawar Khyber Pakhtunkhwa. The existing Shaikh Zayed Islamic Centre, University of Peshawar teachers shall, subject to the qualifications, experience and criteria prescribed in these Statutes, have the right to opt for appointment on a post undertheTenureTrack Pay Scales. 1. 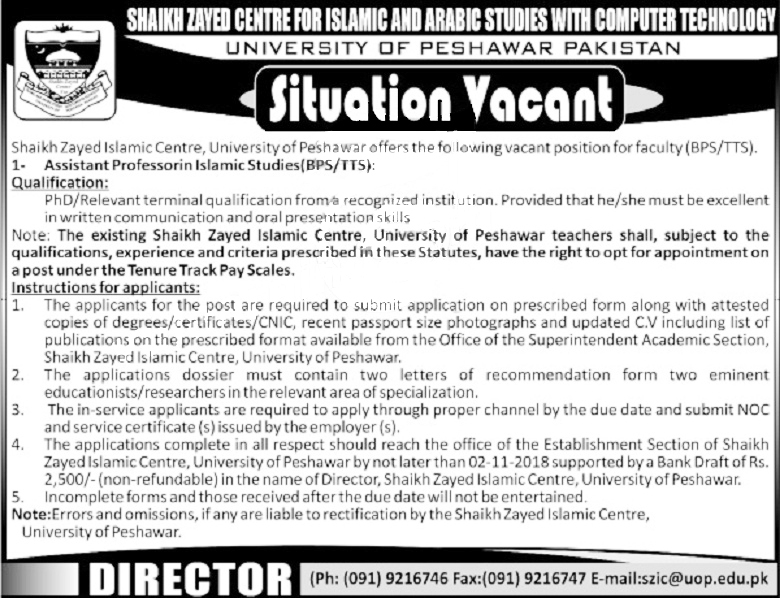 The applicants for the post are required to submit an application on prescribed form along with attested copies of degree certificates/CNIC, recent passport size photographs and updated C.V including a list of publications on the prescribed format available from the office of the Superintendent Academic Section, Shaikh Zayed Islamic Centre, University of Peshawar. 3. The in-service applicants are required to apply through proper channel by the due date and submit NOC and service certificate(s) issued by the employer(s). 4. The applications complete in all respect should reach the office of the Establishment Section of Shaikh Zayed Islamic Centre, the University of Peshawar by not later than 02-11-2018 supported by a Bank Draft of Rs. 2,500/-(non-refundable) In the name of Director, Shaikh Zayed Islamic Centre, University of Peshawar. 5. Incomplete forms and those received after the due date will not be entertained. Note:- Errors and omissions, if any are liable to rectification by the Shaikh Zayed Islamic Centre, University of Peshawar.